Yesterday the nation of Iran marked the 31st anniversary of the Islamic Revolution, which transformed the country into an Islamic republic. The GIS Research & Map Collection (GRMC) in Bracken Library has just received a country profile map of Iran from the Central Intelligence Agency. The map was created in 2009 and includes a location map and a comparative area map, which shows the country's size in relation to the United States. 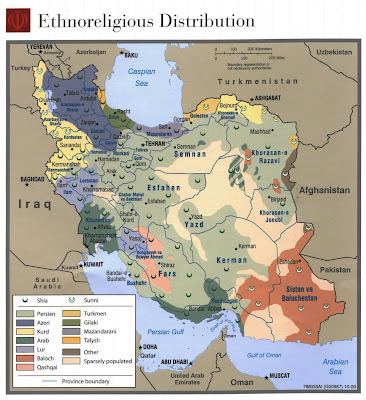 Ancillary maps include key petroleum sector facilities, regional physiography, Souther Caspian energy prospects, a map of the Strait of Hormuz, a population density map, and a map showing the ehtno-religious distribution in Iran (Click to enlarge above). The map includes a list of major historical events in Iran since 1908. A section on the geographic and cultural profile of the country includes details about terrain, land use, climate, natural resources, economic factors, language, literacy, and time zone information. Iran: Country Profile map may be circulated from the GRMC for two weeks or longer. The map is encapsulated in plastic for convenient display in a classroom or for a presentation. For more information about maps available from the GRMC, please call 765/285-1097 Monday through Friday from 8:00 A.M. to 5:00 P.M. Eastern time.